For the first time, EMBL* researchers have captured microglia nibbling on brain synapses. Their findings show that the special glial cells help synapses grow and rearrange, demonstrating the essential role of microglia in brain development. Nature Communications will publish the results on March 26. Around one in ten cells in your brain are microglia. Cousins of macrophages, they act as the first and main contact in the central nervous system's active immune defense. They also guide healthy brain development. Researchers have proposed that microglia pluck off and eat synapses – connections between brain cells – as an essential step in the pruning of connections during early circuit refinement. But, until now, no one had seen them do it. That is why Laetitia Weinhard, from the Gross group at EMBL Rome, set out on a massive imaging study to actually see this process in action in the mouse brain, in collaboration with the Schwab team at EMBL Heidelberg. "Our findings suggest that microglia are nibbling synapses as a way to make them stronger, rather than weaker," says Cornelius Gross, who led the work. The team saw that around half of the time that microglia contact a synapse, the synapse head sends out thin projections or 'filopodia' to greet them. 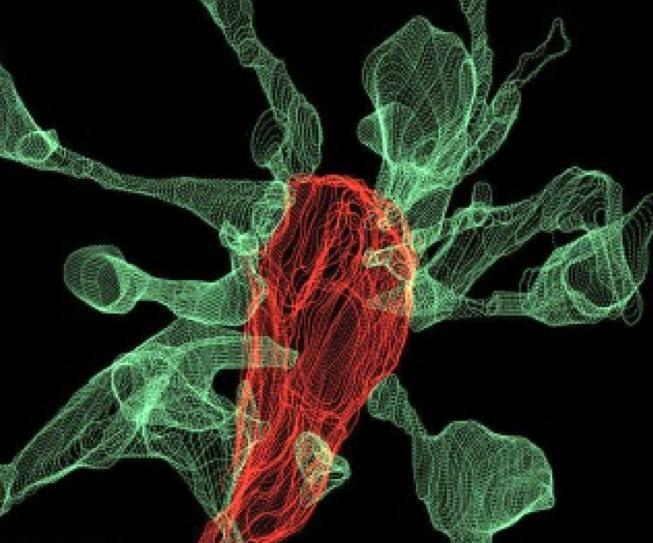 In one particularly dramatic case – as seen in the accompanying image – fifteen synapse heads extended filopodia toward a single microglia as it picked on a synapse. "As we were trying to see how microglia eliminate synapses, we realised that microglia actually induce their growth most of the time," Laetitia Weinhard explains. It turns out that microglia might underly the formation of double synapses, where the terminal end of a neuron releases neurotransmitters onto two neighboring partners instead of one. This process can support effective connectivity between neurons. Weinhard: "This shows that microglia are broadly involved in structural plasticity and might induce the rearrangement of synapses, a mechanism underlying learning and memory." Since this was the first attempt to visualise this process in the brain, the current paper entails five years of technological development. The team tried three different state-of-the-art imaging systems before she succeeded. Finally, by combining correlative light and electron microscopy (CLEM) and light sheet fluorescence microscopy – a technique developed at EMBL – they were able to make the first movie of microglia eating synapses. "This is what neuroscientists fantasised about for years, but nobody had ever seen before," says Cornelius Gross. "These findings allow us to propose a mechanism for the role of microglia in the remodeling and evolution of brain circuits during development." In the future, he plans to investigate the role of microglia in brain development during adolescence and the possible link to the onset of schizophrenia and depression. *EMBL is Europe's flagship laboratory for the life sciences. We are an intergovernmental organisation established in 1974 and are supported by over 20 member states. EMBL performs fundamental research in molecular biology, studying the story of life. We offer services to the scientific community; train the next generation of scientists and strive to integrate the life sciences across Europe. We are international, innovative and interdisciplinary. We are more than 1600 people, from over 80 countries, operating across six sites in Barcelona (Spain), Grenoble (France), Hamburg (Germany), Heidelberg (Germany), Hinxton (UK) and Rome (Italy). Our scientists work in independent groups and conduct research and offer services in all areas of molecular biology.Our research drives the development of new technology and methods in the life sciences. We work to transfer this knowledge for the benefit of society.